Ok, I’m about to get real, deep and personal today. 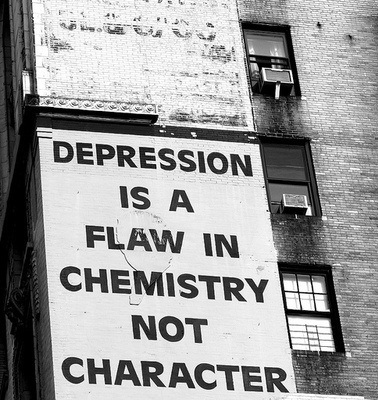 It’s no secret I’ve been battling depression for most of my life. It is an invisible disease that, like others, runs in my family. My Mom-ster obviously has it, in fact she would constantly rant and rave about being manic-depressive when I was younger. I was diagnosed at 19 with not only being bipolar, but also having borderline personality disorder. I treated my disease the same way Mom-ster did – I let the monsters grow and fester inside. After I got married, the stress of marriage and pressure to be normal became overwhelming and my sanity started slipping fast out of my grip. My ex-husband surely didn’t help matters, as he was a gas-lighter and button pusher. In a last chance attempt to save what was left of my sanity, I finally started taking head meds, as I like to call them. My doctor started me on Paxil with no success. I had violent dreams of bludgeoning people to death and would wake very anxious. Next was Prozac, which worked for a short time, but then it was back to business as usual. I moved from med to med over the years trying to find something to quiet my mind, to stop the incessant spinning and spirals out of control. Wellbutrin was the worst. I would have blackout moments where whatever I found myself doing, I was completely removed from it, as if I were outside my body watching, but I had no control over what I was doing. I still have flashes of those days, and it scares me. Finally, Effexor seemed to help, even though I still felt like a zombie. I hated being dependent on head meds to feel normal, so I started researching natural cures and therapies. I slowly weaned myself off the meds and went full natural with my therapy. It took a while, but I finally found my balance for the first time without those chemical pharmaceuticals in my body. I found ways to stop the over thinking and the emotional spirals of my depression and anxiety before they got out of control and took me down into a whirlwind of self-doubt, hatred and rage. I fought the demon successfully for almost 10 years. The past 4 months I’ve been really struggling. I’ve said to others it was writers block and work stress. 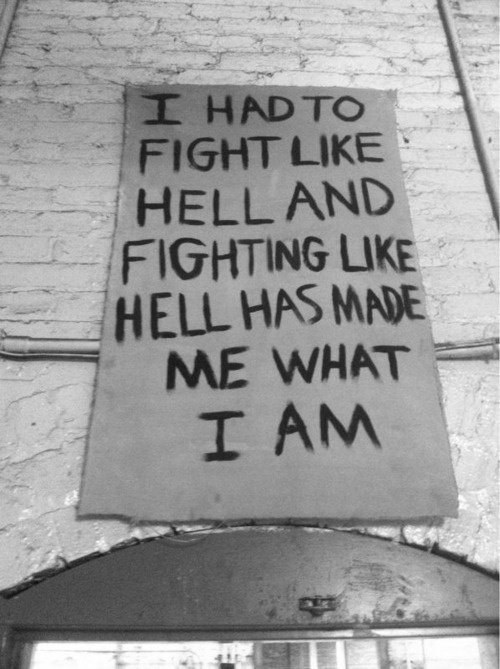 The truth of the matter is I started losing battles to the demons depression and anxiety over and over. They have teamed up to constantly deliver me a one-two-punch since November of last year. The over thinking, the feelings of separation from my body and actions, the spirals of hatred and rage, the paralyzing self-doubt, the suicidal thoughts – it’s crippled me. I pride myself on being a strong woman and having tamed this hot mess of a monster inside of me. Being powerful and strong means having the courage to admit when things are out of control and you need help. I finally admitted to my doctor yesterday that I need help. I told her I don’t want to be a zombie again nor do I want to lose my creativity to synthetic joy. After talking honestly with her, we both decided that I need to temporarily go back on head meds. After leaving her office, the monsters in my head took over – I never felt more defeated in my life. It was like admitting that the way I’ve been coping these past 10 years was a joke. I felt so weak. “Head meds are like a crutch”, the monsters in my head were whispering to me. I went for a drive and thought long and hard about going back on the meds. And then I remember what Mom-ster once said. I don’t want to be like her. I don’t mean in refusing to take head meds – I don’t want to have that demon monster take root and fester inside me like it has with her. I know a lot of her problems stem from her not letting things go from her past and from holding onto anger and resentment, not from not taking head meds, but I don’t want to ignore something if it is going to help me get my footing back and control the monsters again. If there is something out there that is going to quiet the voices of the monsters inside my head and keep them from reproducing, then I should at least try it. I’m tired of doing things I’m ashamed to even admit doing to feel good inside. They always make me feel a thousand times worse and spiral me into the self-hatred even more. I have a horrible de-motivating and self-sabotaging monster inside of me and it’s getting extremely out of control. I picked up my new head meds – Cymbalta – yesterday. I didn’t start them yet. I kept staring at the bottle on my nightstand last night, reading through the pharmacy leaflet over and over again. One of the side effects is weight loss, so I guess that’s a plus. I fell asleep contemplating taking my first dose. Tonight, I promise, I will start the head meds so I can get my head screwed back on straight and say good-bye to the monsters in my head. Hmmm, sounds like you lived with a toxic mother also, and that’s why I’ve been on psych meds and in therapy all of these years. I don’t drink (migraines), but she “drove me to drink” with years of hell, as it was always about her. But now, after the umpteenth time to try and reconcile, I throw my hands up and she’s out of my life for good. This is the best I’ve felt. I can breathe and not feel guilty. Sorry what you’ve gone through, it’s a lonely life with/without a mom “there” for you. I commend you for having the strength to admit to moments of weakness.